You’ll stand up and cheer for this feel-good sports thriller starring Brandon Routh (Superman Returns). The ancient sport of lacrosse has been part of their tribal heritage for centuries, but the Native American players on the Crooked Arrows high school team are long-time losers. When former star player Joe Logan (Routh) agrees to coach the rag-tag group to seal the deal on a lucrative casino project, he sets out to turn the chumps into champs and, in the process, learns the value of loyalty himself. If the Arrows can learn to shoot straight and challenge their prep school rivals, these fast-breaking warriors may just pull off the ultimate upset and win it all! 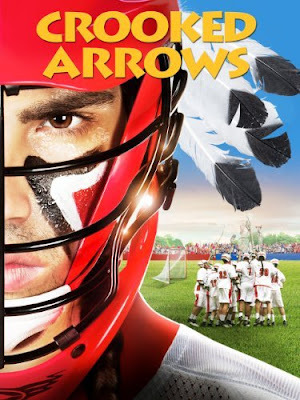 I had my nine-year-old son and 15-year-old daughter watch Crooked Arrows. My daughter didn't understand it. She said there were some parts in another language and the subtitles made her feel like she was missing something. My son really liked it. He said there was a lot of action and the storyline was really interesting and he said he didn't even know what Lecross was but now he's very interested in the game. He said the story was sad and inspiring and fun too. In the end, I'll have to leave it as a mixed review. Disclosure: All opinions are my own. I received Crooked Arrows at no cost for the purpose of this review. No other compensation was received.